So in our first blog we told you what a demanding life being a racing driver can be – even in the off-season, and last week further proved that! It’s not just a case of the main seasons being over and now we can all sit back and relax until next season…the team and our drivers want to excel in every Formula that we compete in; we and the drivers are hugely competitive and want to be in the best possible position for next season and the best way to do that is to get back out on-track! We all know the saying ‘practice makes perfect’…and that’s what we’ve been doing – practicing and practicing and practicing! Last week, almost every Fortec team was out testing – Alex Lynn collected his Formula Renault 2.0 UK Championship trophy in Oxford on Saturday night and on Monday morning he was at Rockingham Motor Speedway for another British F3 test, following on from a really successful test at the ever-popular Monza circuit. Scott Pye – who is currently trying to secure financial backing for the 2012 F3 season with us – joined the Fortec team on the Monday and thoroughly enjoyed his day while Lynn spent two days out on track, gleaning as much information from the car as possible as he looks to prepare himself as well as possible for the step up to F3 next year. Lynn had one day’s rest and was then straight back in the cockpit for another two-day test at Silverstone. This time, the FRUK Champion was joined by a number of Formula Renault cars as the team looked to gain more experience in preparation for the Formula Renault UK Finals Series which begin at Snetterton this coming weekend. Although the dreary conditions were less than pleasant for the teams and drivers, they were in fact ideal preparation for the Finals Series as we’ve accepted that our Indian Summer is well and truly over…the heatwave of Brands is now a distant memory…maybe the name change from Winter Series to Finals Series was partly in the hope of having less wintry weather, we’ll see if it has any effect! The Formula Renault BARC guys, who will be taking part in the BARC Finals Series across the same two weekends, were also in action on Friday as the team headed down to Brands Hatch for a one-day test at the Kent circuit. Rain in Spain came as something of a surprise to the World Series by Renault Formula Renault 3.5 teams who were testing in Aragon on Thursday and Friday last week, compromising the testing sessions somewhat but today is looking a lot brighter in Motorland as F3 star Lucas Foresti tries out a Fortec WSbR 3.5 car at the Motorland circuit. Back at our Daventry base, it’s all go as the Finals Series is nearly upon us…time really is flying by at the moment and it’ll be Christmas before we know it at this rate! This all goes to show how hard the team works as we strive to be the best and loving what we do makes it that little bit easier! Well all the main seasons may have drawn to a close now but that doesn’t mean the drivers have it easy until next year – far from it! It was a fantastic weekend for Fortec at Silverstone for the Formula Renault 2.0 UK and Formula Renault BARC season finales. Alex Lynn’s Championship victory at the Northamptonshire circuit was the culmination of hard work and effort from both Alex and his team throughout the season, and scoring a record number of wins this season was the icing on the cake for the 18-year-old star. Meanwhile, Oliver Rowland, who has come into his own in recent months, has been a pleasure to watch over the past weekends. 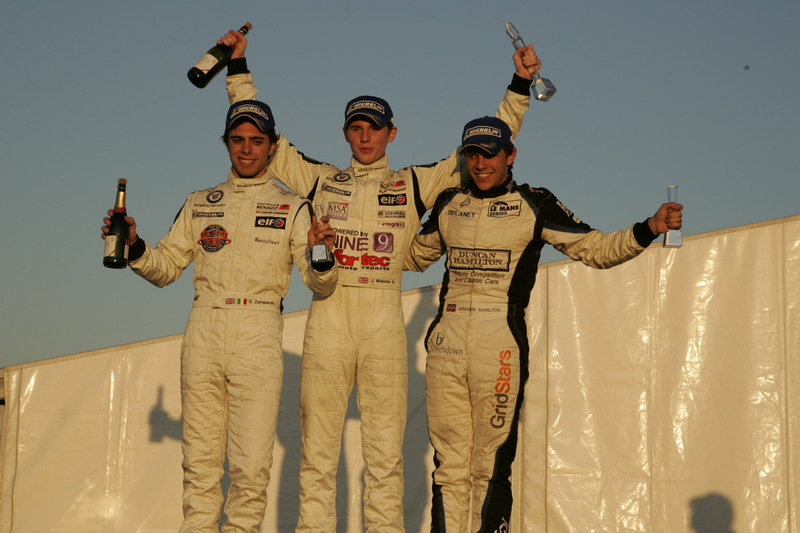 Recording his maiden victory at Rockingham, Oliver won four of the last six races of the season. 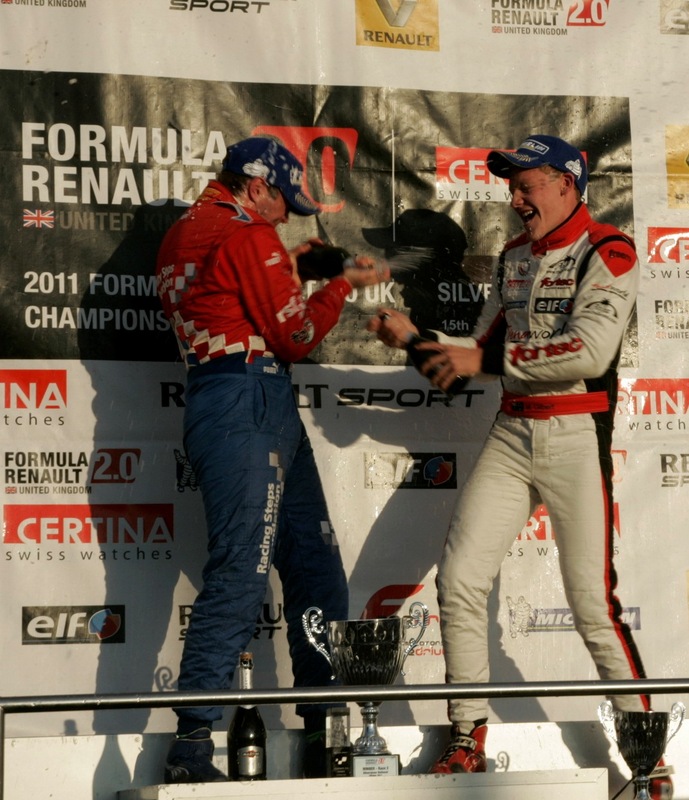 With that decisive victory under his belt, Rowland came alive, winning two from two at Brands Hatch, bringing the 19-year-old into contention for second place in the Drivers’ Championship in only his first year in car racing. 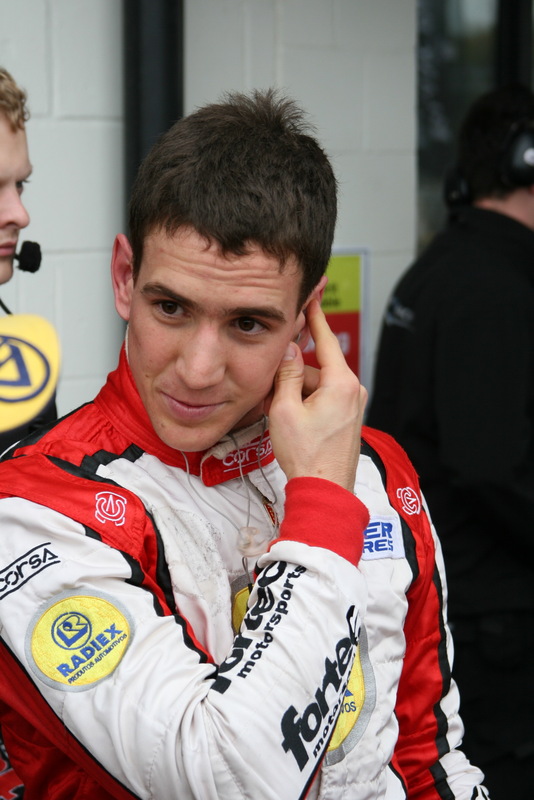 Having seen his teammate clinch the title in race one at Silverstone, it remained mathematically possible to further ruin Tio Ellinas’s day by lifting second place from him in the final race of the season. With the bit between his teeth, Rowland knew exactly what was required of him; only a win and fastest lap was good enough and in a nail-biting final lap, Rowland did just that – crossing the line he saw the time flash up and he knew it was enough. It really was a remarkable achievement for Oliver. Rowland and Gilbert enjoy the Champagne as Rowland secures 2nd place in the standings. Photo credit Paul Davies. A great weekend for the Formula Renault BARC team, too; none of the Fortec racers collapsed under the pressure of the TOCA weekend as the drivers raced in front of crowds far larger than at any other BARC weekend. While Josh Webster was understandably disappointed to miss out on the Championship, he’s a worthy Vice-Champion and his talent and composure has certainly impressed. Archie Hamilton recorded his best finish of the season in Saturday’s race; the 20-year-old has had a string of third places but the Fortec man went one better in race one to move up to the second step on the podium and the whole team performed impressively throughout the weekend. Webster celebrates victory in race one as Hamilton records his best finish of the season. Photo credit Paul Davies. Think they can sit back and relax now? Not a chance – a driver’s mind is rarely off racing. Indeed, Alex Lynn didn’t even have time to celebrate Championship victory on Sunday as he jetted off to Monza immediately after race two. With just a few hours’ sleep the Champion was out on track in a F3 car, testing at the phenomenal Monza circuit for the first time in his career. He certainly impressed – finishing just three tenths behind this year’s double-pole man Will Buller and Lynn has shown all the signs that he’ll make the step up to F3 with relative ease. 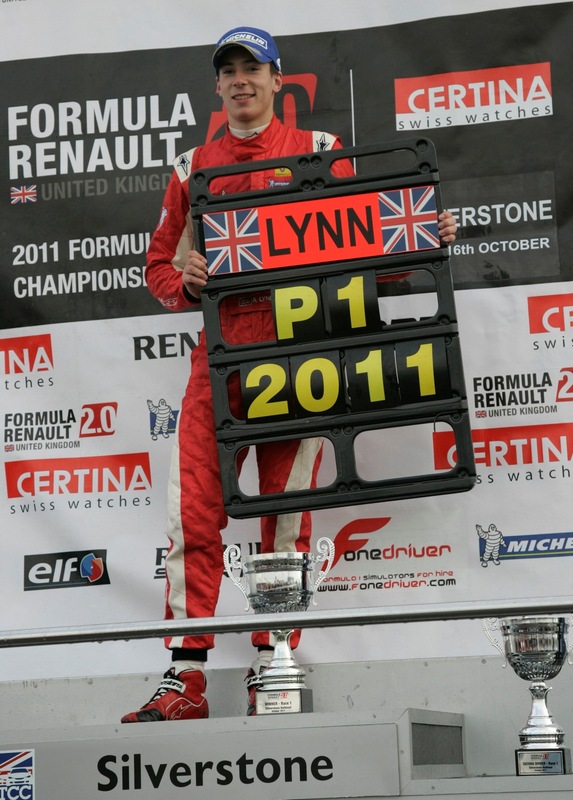 Lynn celebrates Championship glory hours before jetting off to Monza. Photo credit Paul Davies. Meanwhile, Josh Webster hasn’t had time to relax either – Thursday saw the 17-year-old take to the track with Harry Tincknell and others for the Henry Surtees Trophy Race. Lucas Foresti has also been back on-track; the Brazilian spent two days testing a World Series by Renault car last week in Barcelona. More F3 testing takes place today and, in November, Alex Lynn and Oliver Rowland – two of only six drivers to be nominated for the McLaren AUTOSPORT BRDC award – will undergo a demanding assessment in a range of areas as the award hopefuls are put through their paces to decide who the eventual winner will be. It’s not just a weekend job for our boys – in between racing, testing, fitness and trips to the factory it’s actually a hard, busy and tiring life when you’re “living the dream”!